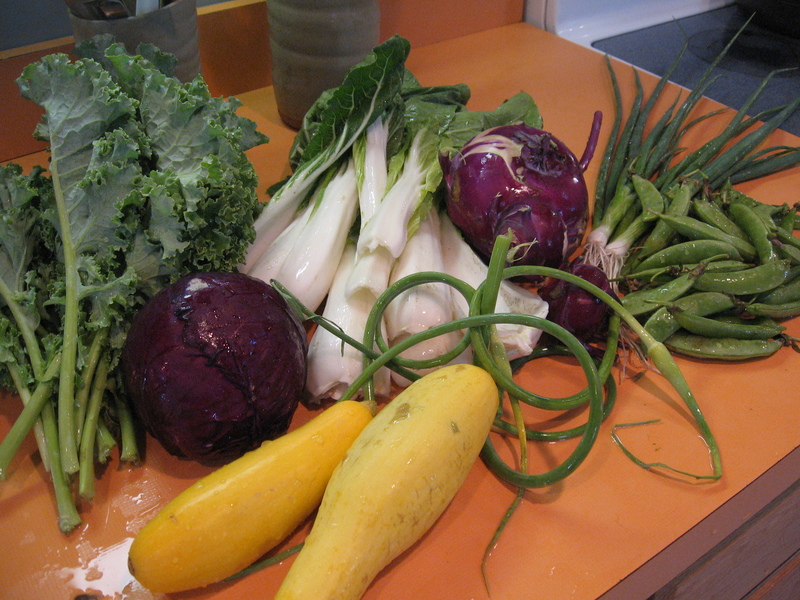 So, we know that sometimes your CSA share can be a little daunting. (How do I store green garlic? How will I use all of these vegetables? What on earth am I supposed to do with the mutant-looking kohlrabi?) And, we know that your lives are busy enough that this isn’t always enough time to spend hours scouring recipe books and cooking blogs for the perfect thing to do with fresh spring peas. So, we’ve decided to take the challenge for you. Starting this week: The Vegetable Spotlight Challenge. For Chefs. One week. One ingredient. Fame, glory, and four very full farmer bellies. That’s right. Each week, the farmer’s over here are choosing one ingredient to highlight. Check in here on Mondays (I know, I know, I’m already running behind schedule this week) to find storage tips, cooking discussions, and recipes (with pictures!) from what we eat here in the farmhouse! Hopefully, this will give you some ideas as you plan out how to use your vegetables for the week. 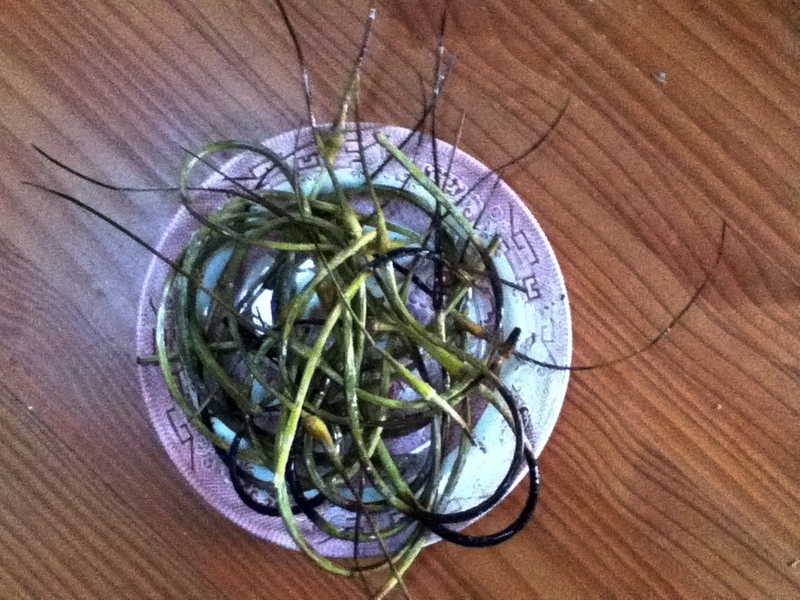 First up, ahem, drum-roll please….. Garlic scapes! Those alluringly curly but potentially perplexing green rods. Maybe you’ve tried them, maybe you love them, maybe you’ve never been bold enough to choose a unit of them over a unit of spinach. Regardless, it’s time to give them a second look. As we posted about earlier, garlic scapes are the reproductive part of the garlic plant. They grow out of the top of the bulb and begin forming little heads of cloves. Their taste is a little milder than a garlic bulb, but they can still pack a punch, and while you’re still waiting for the cured bulbs, scapes have a lot of the same health benefits as the other parts of the garlic plant. Plus, they’re more versatile than you think: you can eat them sauteed, grilled, chopped up like regular garlic, or pureed into soups of pestos. This week, our recipes feature oven-roasted crispy scapes, pasta and garlic scape pesto, and peanut and sesame noodles with vegetables and scapes. 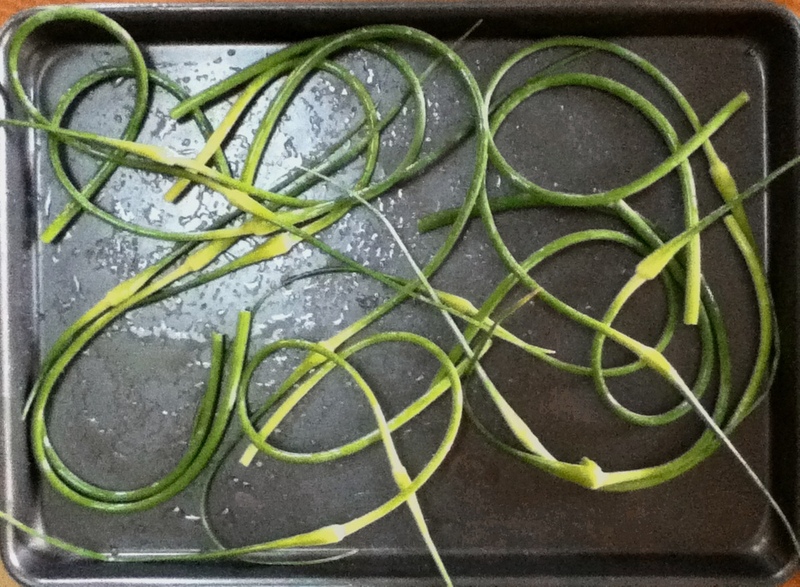 On Monday, I roasted garlic scapes, which is insanely easy, but I somehow still managed to botch. Ideally, you want to follow one of two methods: 1) preheat the oven to 500 degrees Fahrenheit and roast for 8-15 minutes until the scapes are starting to brown on the edges (this is where I want wrong, by the way: I walked away from the oven, and they got quite crispy. They were still a hit at the farmhouse, though, where we’re always looking for potato chip alternatives.) or 2) Preheat the oven to 350 degrees and roast for 25-25 minutes, until tender. Either way, roasting the scapes makes them mild and delectable enough to stand alone as a vegetable side dist with dinner. Plus, they look fancy enough to serve to company. 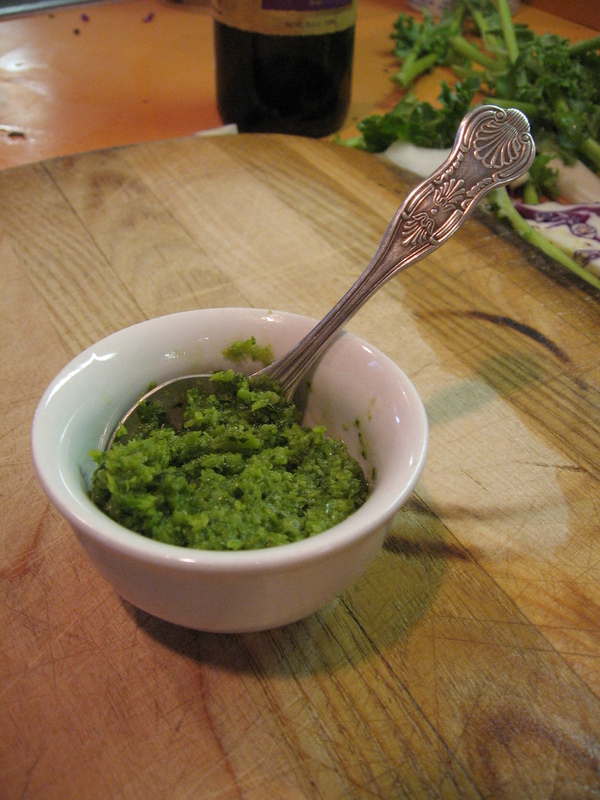 On Wednesday, Kayla broke out the Cuisinart and served up a garlic scape pesto with whole wheat pasta. She felt that the pesto was too pungent in its raw state and sauteed it briefly before tossing it with the pasta. Whatever, she did, I have to tell you, it was freaking delicious. You can find a basic recipe here, but if you want to cook the pesto at all, I recommend cooking it before adding in the Parmesan and lemon. Whichever culinary path you decide to take, the end result is pretty versatile and could conceivably go well on any meal that you have often and would like to change up a bit: steak, grilled fish, pastas, roasted vegetables, omelets, sandwiches, or even just crackers. And, finally, on one very hungry Thursday night, Theresa sauteed up all of the veggies below with an 8 oz package of soba noodles and this peanut sauce (though she used chunky peanut butter instead of smooth). 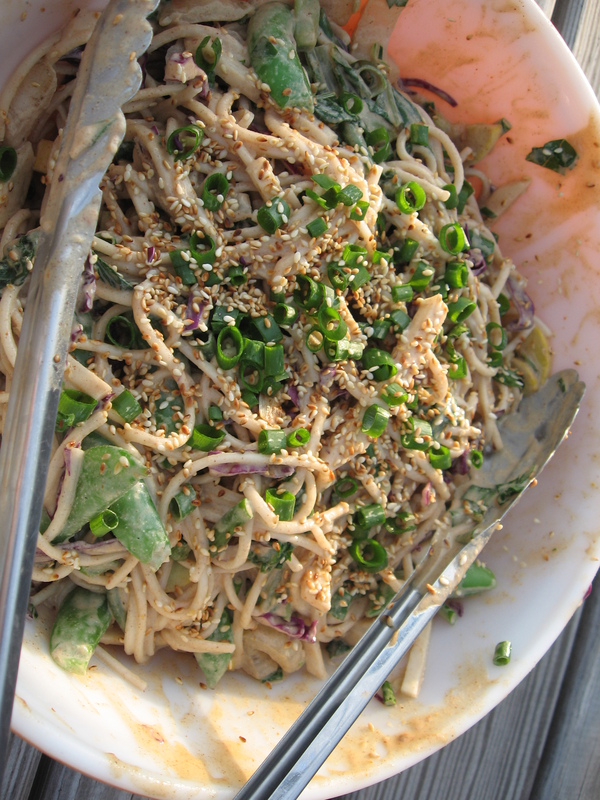 The garlic scapes played well off of the creaminess of the peanut and sesame sauce. And, I’d bet that the rich creamy peanut sauce might be able to convince some of the pickier eaters you may know to have a few extra vegetables at dinner. On an only slightly related side-note, this is how many vegetables three of us can eat for one dinner alone. 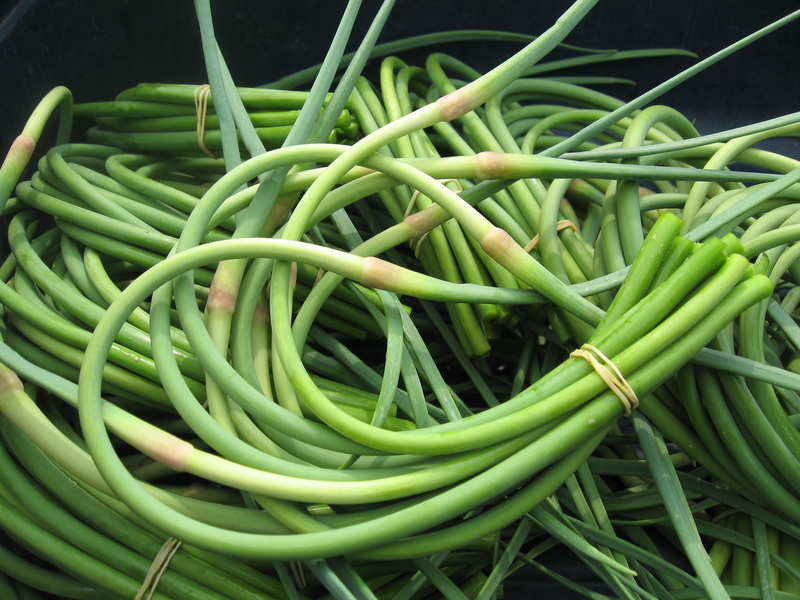 Cooks out there, did you have any scapes this week? We’d love to know what you tried, what worked, what didn’t work. Post your own recipes in the comment section below! Stay tuned for next week’s installment. At this very moment, our talented cooking farmers are hard at work trying to concoct as many pea recipes as they possibly can to give your dinners next week a little inspiration.